The ball may be played with the flat side of the stick only. When the ball goes over the side line, the opponent takes a side-in at the spot where the ball went out of bounds. The game may be re-started by passing the ball to a teammate or by taking it on the dribble as a self-pass. When the ball unintentionally goes over the backline off the stick of a defense player, the game is re-started with a long corner. The long corner is taken from a spot on the sideline 5 yards from the corner flag on the side of the field where the ball crossed the backline. If the attacking team sends the ball out of bounds over the backline, the game is re-started with a self pass or hit at the 16-yard line by the defense. A free hit is awarded to the opposing team when a foul occurs on the field and must be taken near the spot where the violation occurred. If the attacking team fouls in the shooting circle, the defending team will be awarded a free hit to be taken anywhere along the 16-yard line. In every case, when the side-in, long corner, or free hit is taken, the ball must be stationary and the play will be re-started by passing the ball to a teammate or by taking it as a self-pass. A free hit, which is not a ‘self-pass’, requires the ball to move at least one meter before it can be played by a teammate. All other players must be at least 5 yards from the hit. The free hit should not be penalized when the ball lifts slightly off the ground if the intention to play along the ground is clear and the hit itself is not dangerous and/or does not lead to dangerous play. This can be confusing to spectators because they may not understand why the umpire does or does not blow the whistle when the ball rises slightly on the hit. In fact, the umpire must determine whether the ball is being lifted as a result of technique used by the hitter, or if the ground causes the ball to lift in a dangerous manner. The other factor that the umpire must consider is whether the ball is being directed towards a space or towards two or more players. Many high school hockey games are still played on grass where the field itself can often cause the ball to lift. The umpire must control the safety of the game and he/she must be allowed to use good judgement when determining whether the ball has lifted in a dangerous manner. When the defending team fouls in the shooting circle, or if the defenders send the ball over the end line intentionally, a penalty corner will be awarded to the attacking team. Five defenders (including goalkeeper) shall be behind their backline. The rest of the defending team shall be behind the center line. 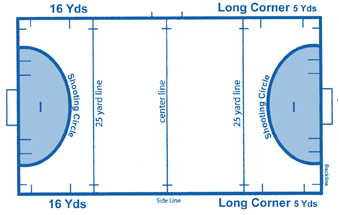 One member of the attacking team shall hit or push the ball from a spot on the end line 10 yards from the goal post and she must have at least one foot completely outside of the field of play. The rest of the attack must be outside the shooting circle until the ball is inserted. The ball should be controlled before shooting for goal. If the initial shot on goal is a hit, the ball must cross the goal line at a height no more than 18 inches (which is the height of the board in the back of the goal). After the initial shot, the attacking team may flick the ball towards the goal in a controlled manner. If the first shot is a flick, then the ball can cross the goal line at any height, as long as it is not a dangerous play. A penalty stroke is awarded when the defense either commits a deliberate foul inside their opponents attacking 25 or intentionally fouls inside the shooting circle, which prevents a goal from being scored. 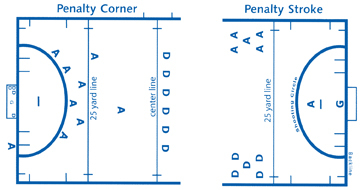 The penalty stroke is taken by a single attacker in the circle (all others beyond the 25-yard line), against the goal keeper, and is taken from a spot 7-yards out, central and directly in front of the goal. The goalkeeper must stand with feet on the goal line, and cannot move them until the ball is played. The attacker, on the umpires whistle, may push or flick the ball at the goal and goalkeeper attempts to make a save. Using the stick in an intimidating or uncontrolled manner, which can result in dangerous play. Playing with the rounded side of the stick. Stick interference.The player should attempt to play the ball -- not hit, hook, hold, or interfere with an opponent’s stick. Undercutting, or raising the ball dangerously. Charging, pushing, tripping, or personally handling an opponent. Deliberately hitting the ball into an opponent. A foul in which a player pushes, shoves, or advances the ball in anyway, using their body, hands, or feet rather than their stick. Note: the goalkeeper may stop the ball with her body. 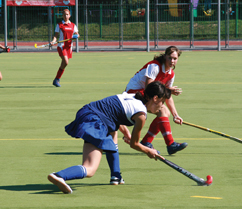 A player in a stationary position shields the ball with her stick or any part of her body; or if a third player takes a position between an opponent and the ball so that her teammate has an opportunity to play the ball. Parents: Please note that a player may receive the ball with her back to her opponent, as long as she immediately moves away in any direction with the ball. Field players may not play the ball with their feet. If the ball accidentally hits the feet and the player gains no benefit from the contact, then the contact is usually not penalized.